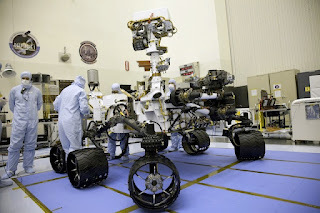 The MSL robotic mission to Mars will attempt to land a Mars rover called Curiosity on the surface of Mars, scheduled to land in Gale Crater on August 6, 2012. 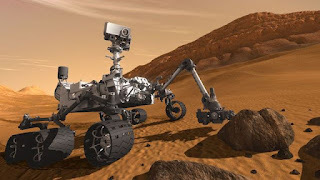 The rover's objectives include determining Mars' habitability, studying the Martian climate and geology, and collecting data for a future manned mission to Mars. 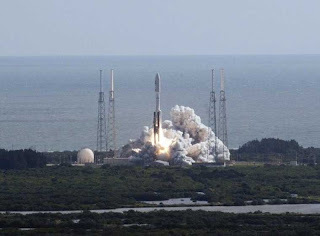 The rover was launched from an Atlas V rocket from Cape Canaveral on November 26, 2011. 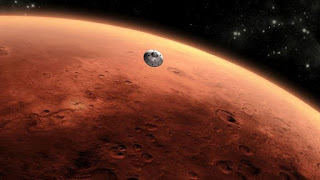 Landing a large mass on Mars is a difficult challenge. The atmosphere is thick enough to prevent rockets being used to provide significant deceleration, as flying into the plume at supersonic speed is notoriously unstable. Also, the atmosphere is too thin for parachutes and aerobraking alone to be effective. The landing sequence alone requires six vehicle configurations, 76 pyrotechnic devices, the largest supersonic parachute ever built, and more than 500,000 lines of code. The spacecraft will employ several systems in a precise order, where the entry, descent and landing sequence will break down into four parts. 1. 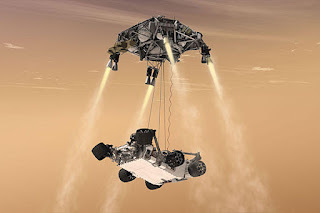 Guided entry: The rover is folded up within an aeroshell which protects it during the travel through space and during the atmospheric entry at Mars. Atmospheric entry is accomplished using a phenolic impregnated carbon ablator heat shield. The 4.5 m (15 ft) diameter heat shield, which will be the largest heat shield ever flown in space, reduces the velocity of the spacecraft by ablation against the Martian atmosphere, from the atmospheric interface velocity of approximately 5.8 km/s (3.6 mi/s) down to approximately 470 m/s (1,500 ft/s), where parachute deployment is possible about four minutes later. 2. Parachute Descent: When the entry phase is complete and the capsule has slowed to Mach 2 and at about 10 km (6.2 mi) altitude, the Mars Science Laboratory will then deploy a supersonic parachute, as was done by previous landers such as Viking, Mars Pathfinder and the Mars Exploration Rovers. 3. Powered Descent: Following the parachute braking, at about 1.8 km (1.1 mi) altitude, still travelling at about 100 m/s (220 mph), the rover and descent stage drop out of the aeroshell. The descent stage is a platform above the rover with 8 variable thrust mono propellant hydrazine rocket thrusters on arms extending around this platform to slow the descent. 4. Sky Crane: To prevent the retrorockets from forming a dust cloud that could damage the rover's instruments, the sky crane system will lower the rover with a 65 foot tether to a soft landing, wheels down on the surface of Mars.